Spright - Get Involved. Make Friends. Enjoy Motherhood. Babies are weird. We’ll help you figure it out. 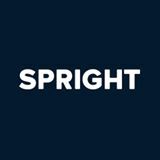 Spright is an app that provides expectant and new moms with support, resources, and expert advice when and where they need it. On the app, moms access expert-led discussions and Q&A sessions on topics like feeding, sleep, intimacy after birth, going back to work after maternity leave, and much more. Access to the app and to most of the discussions/resources is free, with select access to experts and sessions at a fee. We can offer a special discount for some of these sessions to the MOD Moms community.